When I first met Eric Bongard five or so years ago, he was elbow deep in building ice houses. What struck me about Eric is the quality of his craftsmanship as well as his entire command of the building process, from the chassis on up. Fast forward to a few months ago, and Eric and I began collaborating on his business shift to building quality mobile saunas. Eric and I have had countless exchanges back and forth, discussing the many nuances of sauna building and design. We have had countless phone conversations, where we have hatched out such things as hot room size, stove location, sauna bench layout, proper drainage, lighting, window and door placements. Eric wants to make excellent AUTHENTIC saunas. He and I would go back and forth, riffing on the nuances, down to the inch, like a couple of crazy compulsive craft brewers perfecting their pale ale. We met the other day at an area lake in the Twin Cities for our first sauna session. 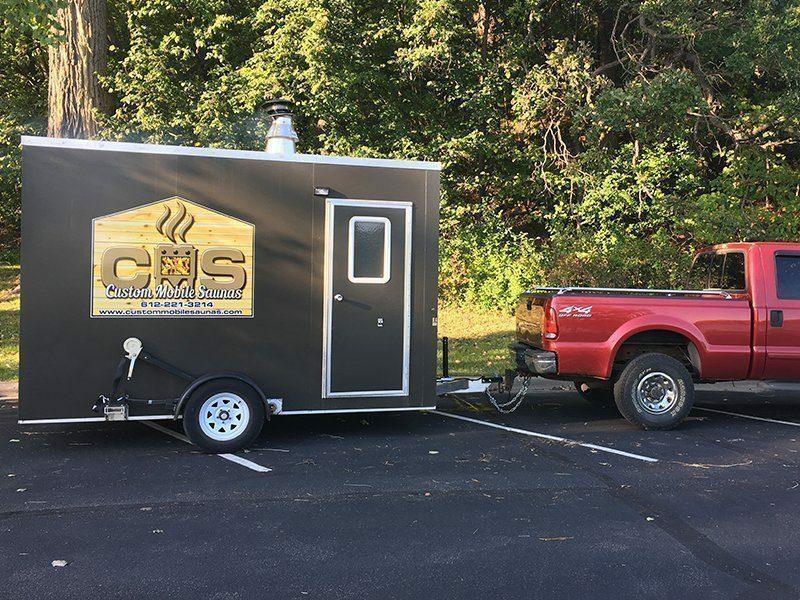 Eric trailered his “Custom Mobile Sauna 1.0” to the parking lot and fired up the stove. He had a fresh cooler of beers on hand, and an empty parking space waiting for me upon arrival. As a builder of many saunas, whenever I step into a new sauna, I am compelled to spending round one sitting on the sauna bench detailing the nuances. By default, I studied “1.0” with a critical eye. I am pleased to report that this is a good sauna. Matter of fact, he and I had a great sauna session. I took three rounds, with a cool lake plunge after each round. On my way home, radiating from the post sauna after glow, I declared that this is a very good sauna. Custom Mobile Saunas wants you to have one of their saunas. DIY – Frame up. Because Eric builds his own chassis, frames and finishes his structures, he is well aware of tongue weights, weight distribution, how the materials hold together and integrate with each other. Moisture/Insulation optimization. Eric’s design is built for long lasting and lots of steam. With the sauna’s I’ve built, I always want to allow for kids to be able to have a water fight in the hot room. Eric’s saunas are no exception. Top of the line Materials. 2×6 all aluminum framing is non inexpensive. Western red cedar is not inexpensive. The Kuuma stove is not inexpensive. Eric’s saunas cut no corners in terms of using the best materials available. Top of the line Craftsmanship. Eric is proud of the work he does and does great work. Experienced. Eric has been building ice houses for many years. He knows how to build mobile chassis and he knows how mobile chassis pull down a road. Eric has not fallen off the turnip truck. Really good heat. I know, I know, i’m a sauna snob. Heat is not heat. I can feel really good heat. This sauna provides really good heat. I have been building saunas for myself and others for over 20 years. I have documented how to build your own sauna via my ebook, Sauna Build Start to Finnish. I have helped hundreds build their own saunas. A few DIY sauna builds are documented on this website (click here). I have helped home owners, contractors, the 612 Sauna Society, and resort owners. I am warmed to help get more AUTHENTIC saunas out into our world. Will, Information, and Time are the prime drivers and resources for building our own saunas. But these are scarce resources. Many of us who are keen on having our own saunas may have plenty of will, but are short on time. This is where Custom Mobile Saunas can come in. Are you ready for your own authentic sauna? Custom Mobile Saunas is offering packages at a fair price. Interested? Good! Reply to me, comments below, or saunatimes@gmail.com and I’ll share more of what I know to help you. Let’s get one of these wheeled over to your house and tucked under your Christmas tree. Could you think of a better present for when the cold wind comes ripping down the alley at dawn? My family already has an awesome Sauna. My Husband and I built it with Cedar. Two levels of benches – great aroma. A friend from finland provided us with a very accurate sauna thermometer and a cedar bucket. Bought our Sauna Stove from a finlander in Tower Minnesota that he had made himself. Works great. Right on Jo. Eric kind of reminds me of the Finlander in Tower MN you mention. They both are craftsmen that take pride in their work, and make great product. Matter of fact, Eric uses the Kuuma stove made by that Finlander from Tower MN. Ain’t it awesome? Love it a great multi purpose sauna- fish house,- tiny shelter. or maybe hot dog stand during special events.lol– This fits into my realm, of rethinking everything for multi purpose year round use. Great job guys.